Atlas, Drago and Dream Maker, the 3 musketeers. They have been together for about 3 - 31/2 years now, get along good. All 3 have great soft fiber, sweet, nice boys, easy to handle, healthy, up to date on all shots and worming. 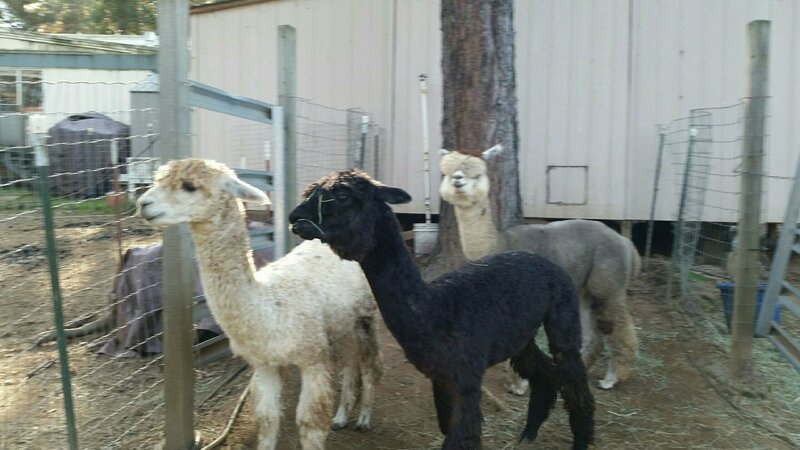 Atlas, and Drago are Suri's ( long ringlet fiber) and Dream Maker is a Huacaya (fluffy teddy bear fiber) Light Fawn, Black and a medium Silver Gray colors. Drago loves kisses and hugs, the other 2 want to but just not sure about it. All will eat pellets from your hand. They are 4 years old and I'm selling them together for $500.00 for all 3. I want them to stay together as they are buddies. I'm down sizing the herd hence the low low prices. Great Pets, Lawn Mowers, Yard Ornaments . Give me a call with any questions, and I can deliver them if you live within 100 miles, you can pick them up, or we can have them shipped if needed.